Southern Style Spare Ribs | Packington Free Range | Born and reared outdoors. Always. After that southern kick? Get messy tucking into the sticky honey coated ribs with hints of chilli, guaranteed to make you go spare. Accompanied with a fresh salad, measuring up a balance of flavours and tastes including sweet orange paired next to salty halloumi to leave the taste buds tingling. Place the ribs in a large dish. Mix together the tomato puree, Worcestershire sauce, sherry, honey and chilli sauce. Stir half the marinade into the ribs to coat evenly. Cover, place in the fridge and leave to marinate overnight. Cover and chill remaining marinade. Preheat oven to 150C/Gas Mark 2. Place the ribs in an oven proof dish and cook for 1 hour, basting occasionally. Meanwhile stand the oranges on a board and using a sharp knife, carefully slice the peel and pith away from the oranges. Slice the oranges and pour any juices into a small bowl. Separate the seeds from the pomegranate. Cut the halloumi cheese into 16 thick slices. Heat a non-stick frying pan or griddle until hot and cook the slices, in batches for 2-3minutes on each side, until golden. Arrange the oranges, blueberries, cucumber, pomegranate seeds, onion, mint and halloumi slices on serving plates. Whisk together the reserved orange juice, lemon juice, olive oil and mustard until well blended. Set aside. Preheat a grill or barbeque. Remove the ribs from the oven and drain off any excess juices. Stir in the remaining marinade to coat evenly and then cook on low heat for about 5-10 minutes, turning occasionally until browned. 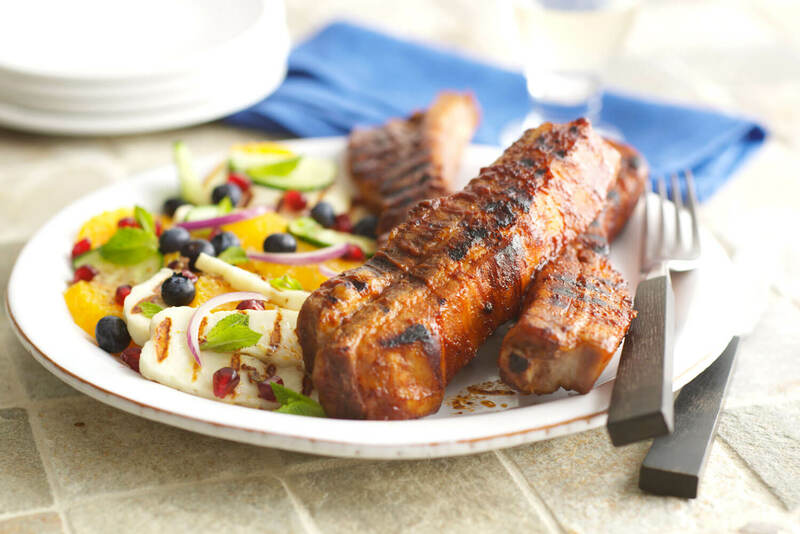 Drizzle reserved dressing over salads and serve with the hot ribs.